Traditionally, April showers bring May flowers, right? Well, April snow showers this last weekend brought me an extra snow day and a day to finish up May Morning Work Stations. Yuck to the snow, but yeah for a day to prep morning work. I know that spring will come . . . eventually! And when it does, my ‘Kinder Garden’ will bloom with May Morning work. If you’d like a quick peek at the activities included in May’s set of stations, just scroll down. I often get emails regarding the manipulatives I use, just click HERE and it will take you to a product list for each month’s stations. Just scroll down to the bottom to find May’s. There you will find a link to items you may like to use. Some of these items have affiliate links to Amazon and/or DollarTree. I do receive a small affiliate payment for these referrals which help me maintain and cover the expenses to keep this blog running. There are 43 in all. This will give you plenty of choices to find the perfect activity for the skills you want your students to practice. I’ll give you a quick description and a materials list to help you find items you may not have readily available. 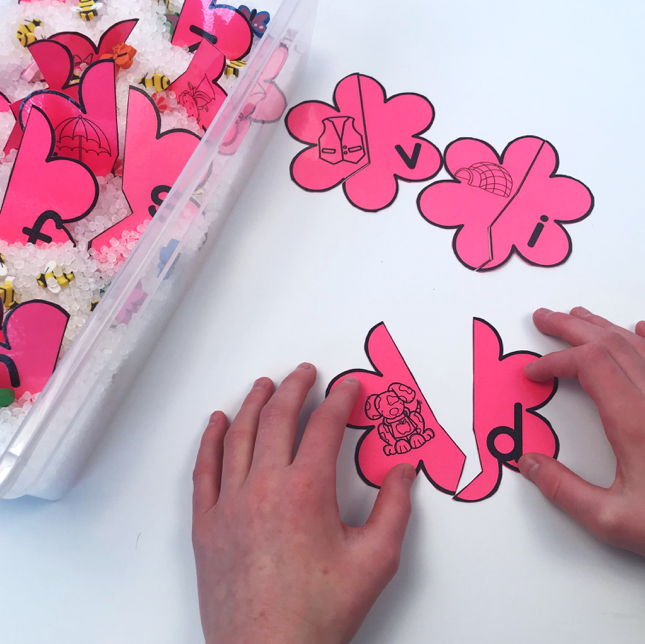 You choose the words you want them to practice and the letters you want to be printed on the bugs. 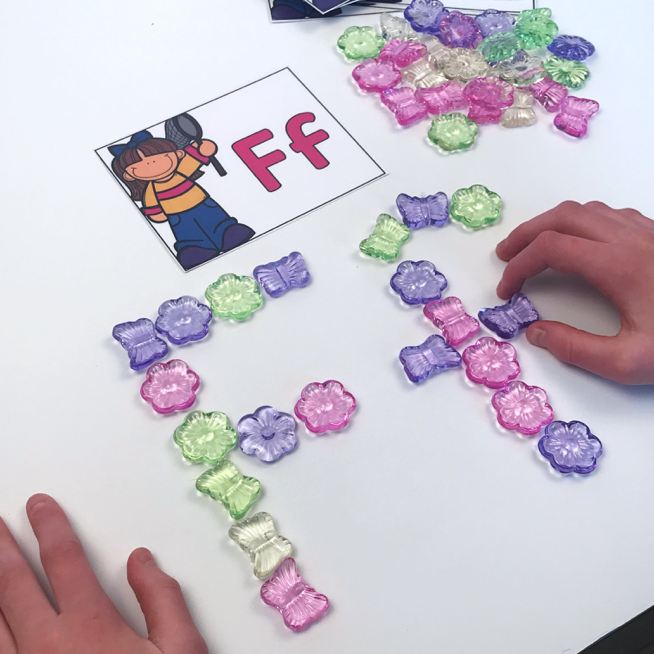 They use plastic links to connect the letter bugs to make the words. 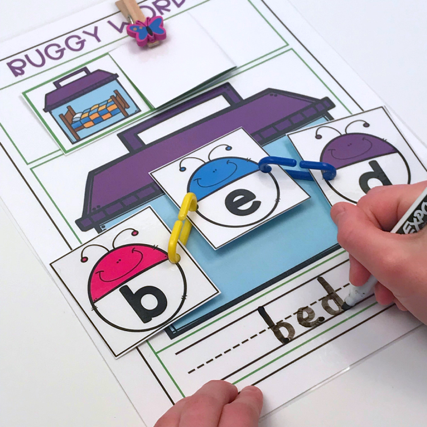 Use those same plastic links and bug letters, but this time spell out the CVC words on the bug boxes and write the word on the mat. Then open the self-correcting card to see if you answered correctly. Student use those plastic links yet again (just when you thought you’d never find a use for them . . .), but this time we are working with numbers. After clipping numbers in order, they match up the ten frame, quantities and tally marks that match by linking them below. 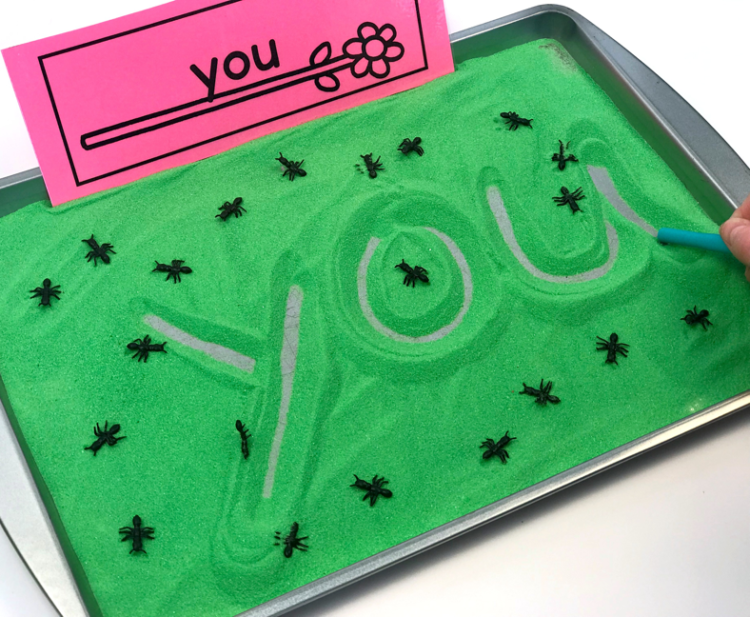 I am always looking for fun ways to get my students to practice their sight words. 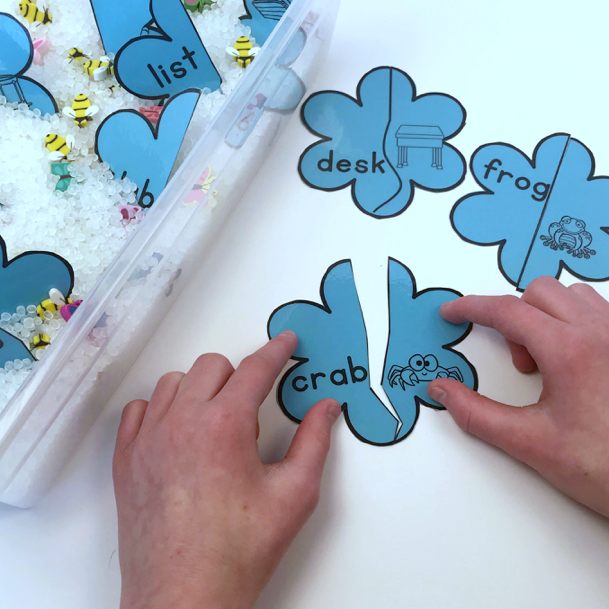 Because these word cards are black and white and editable, you can print off different words on different colored cardstock to easily organize for differentiating. Because you can never get enough play-doh time. . . 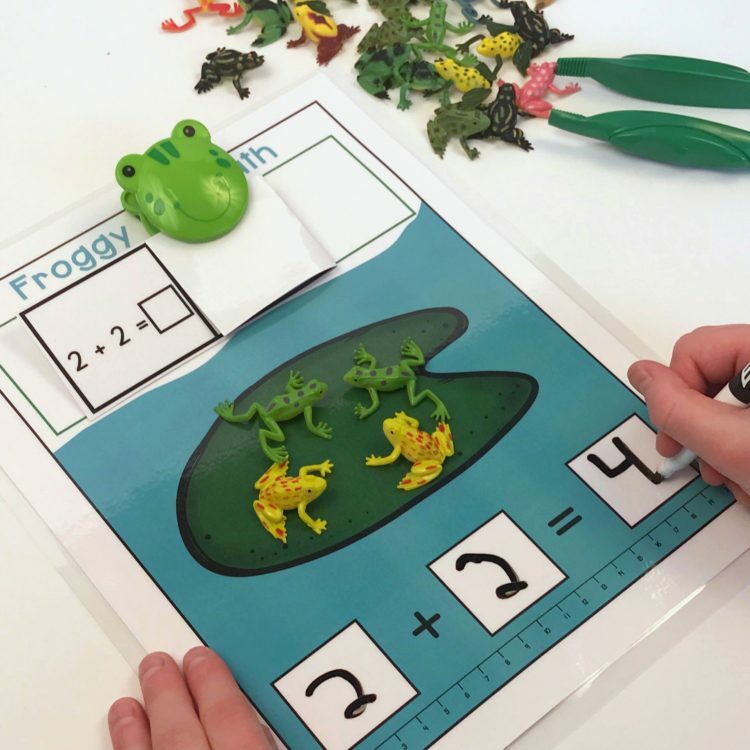 These number mats work on simple numeracy. Dough for making number and raindrops. This version will take the skill a bit farther to incorporate ten frames. And this last option challenges your student to make the number and determine how many more they would need to make ten. 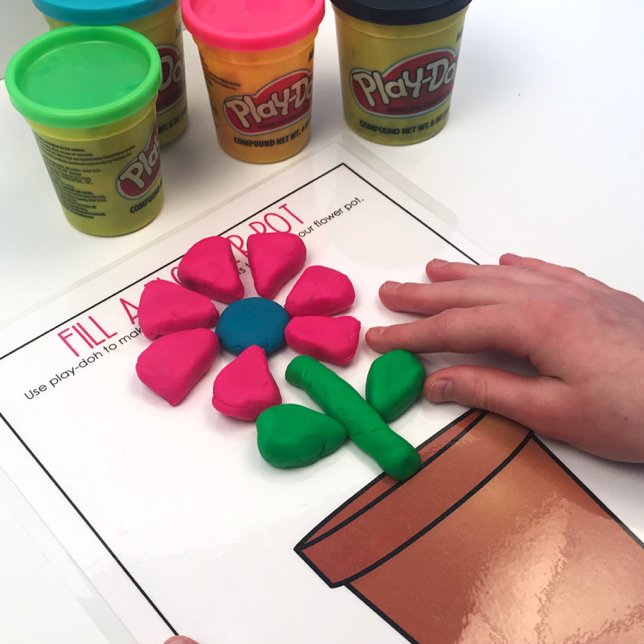 Play-doh fun and skill building . . .
And just for fun, I like to add some more open ended play-doh stations to appeal to those artistic intelligences. 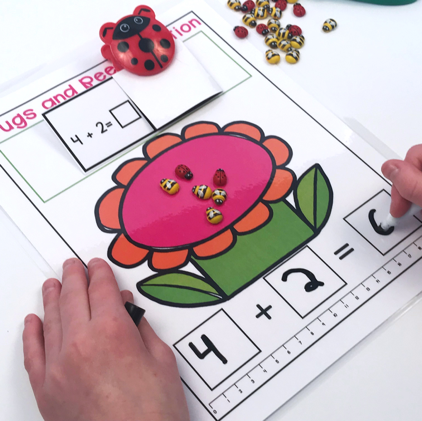 These mats allow students to use their imagination to create flower pots . . .
and bugs for their bug box. Flower pot and bug box mats. 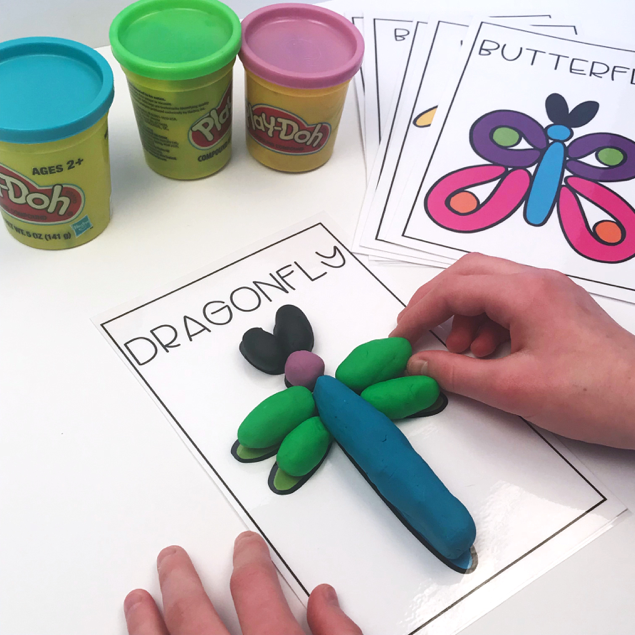 For more guided play-doh art, try these garden themed play-doh mats. For fun, fine motor practice, my students love doing Q-Tip painting. 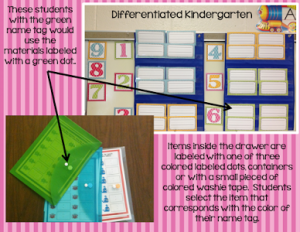 This packet will give you several options so that your students are limited to just one. Just add a little bit of paint, some Q-tips and you have a favorite station. Q-tip picture sheets printed on white paper. Therapy putty is in every month of my morning stations. I love the rresistanceit provides and when you find small items to hide inside, it makes it an incredibly engaging station. This time students just sort by color. In this option, they can sort and graph by color. Finally, for this one, they sort, graph and count. It allows you to meet the readiness levels of a variety of students. 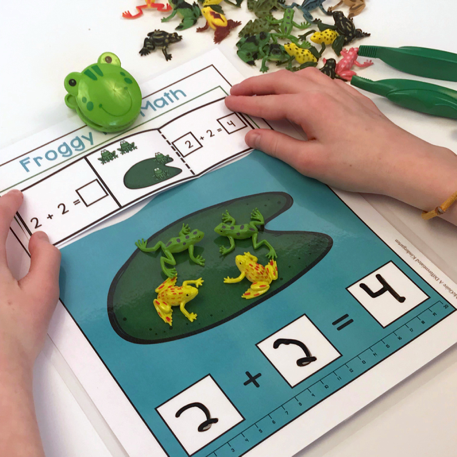 Last months rubber ducks were such a hit in my classroom, I wanted to replicate that fun with these little rubber frogs I found. For this station, you have a choice between CVC words, CVCC/CCVC words and digraphs. You will want to program your frogs with the words on the mat ahead of time. If you play with 2 students, each will need a mat. 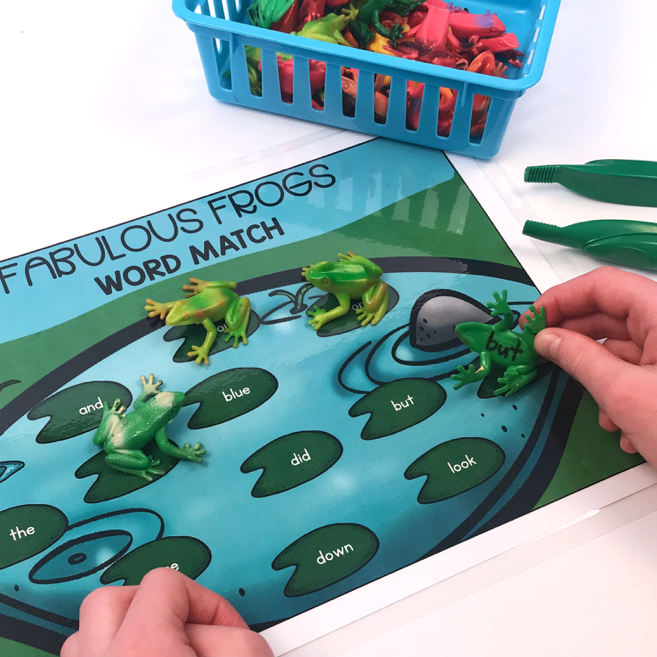 Students select a frog using tongs and match it up to the picture on the mat. The first student to get four frogs in a row wins. 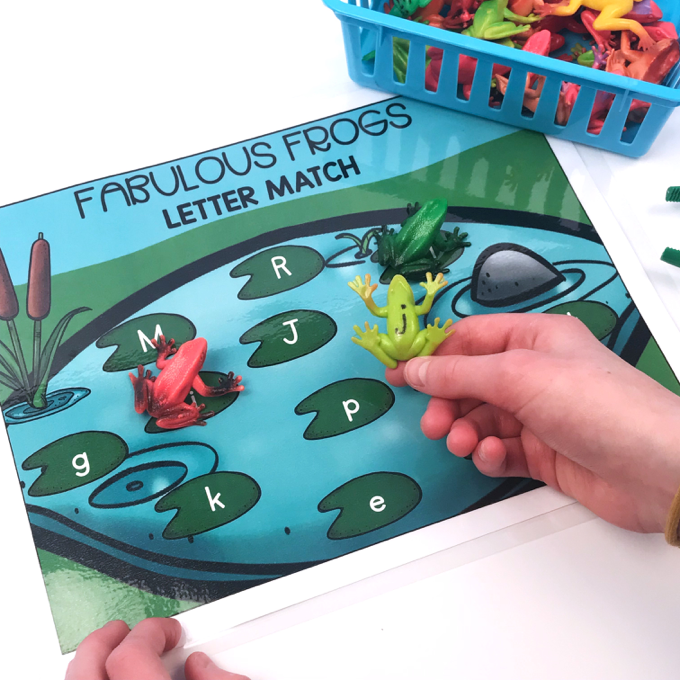 Rubber frogs or plastic mini frogs with CVC, digraph or blend words that match the pictures on the mat written on the bottoms. You can find little plastic bugs just about anywhere. I have these beauties from years and years of doing morning work. I think I got them from the Dollar Tree along with the little bug box I use to hold them. 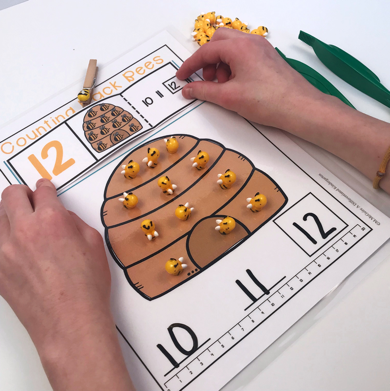 Students use the tongs to move bugs to the playing mat to represent the number on the self-correcting card. When all the bugs are moved, they open the card to see if they are correct. 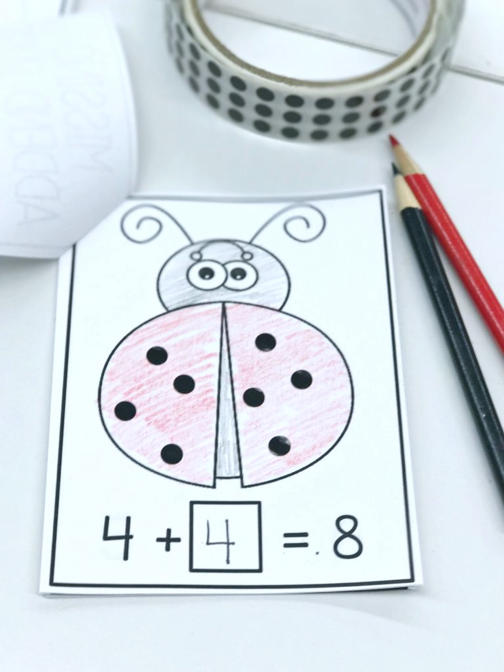 Count Your Bugs self-correcting cards printed on cardstock, laminated, and secured with a clothespins. Bug erasers, small miniature plastic bugs, or whatever small bugs you can find for counting. If you want to extend learning a big, there are a couple of extra options. 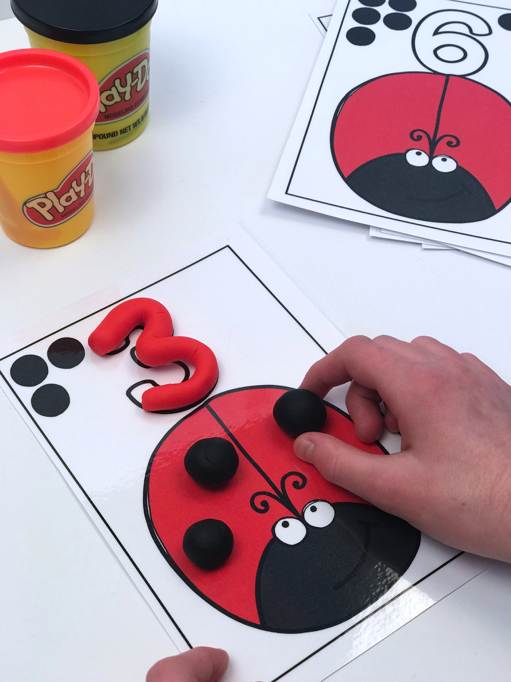 In this one, students use the bugs to make the number and then add one more. When they open it up, they will see if they are correct or not. Self-correcting cards printed on cardstock, laminated and secured with a clothespin. 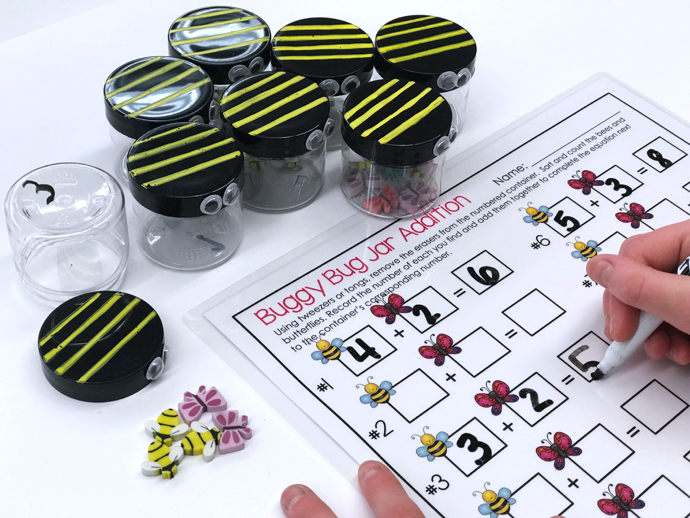 Bugs erasers, small miniature toy bugs or whatever bugs you can use for counting. Or if you are working on subtraction, they can make the number and then take one away to complete the equation. The self-correcting cards for these stations make them oh so independent and that’s just what you want for morning work. Playing mat printed on cardstock and laminated for durability. (One for each student or you could use a bug box or bug jar). 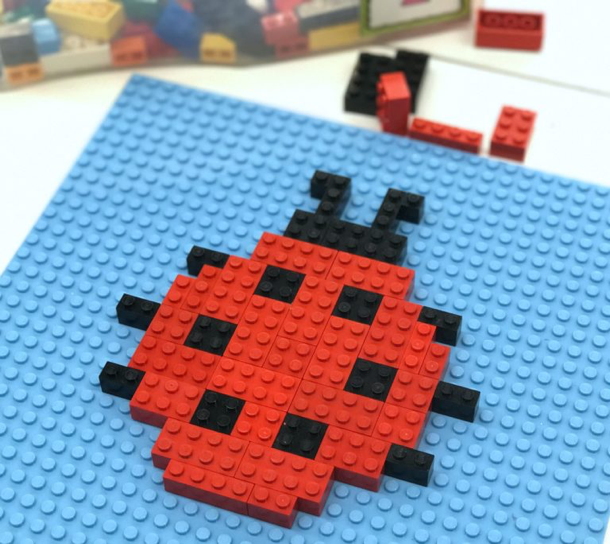 Small toy bugs, bug erasers or whatever you have that is buggy and can be used to count. 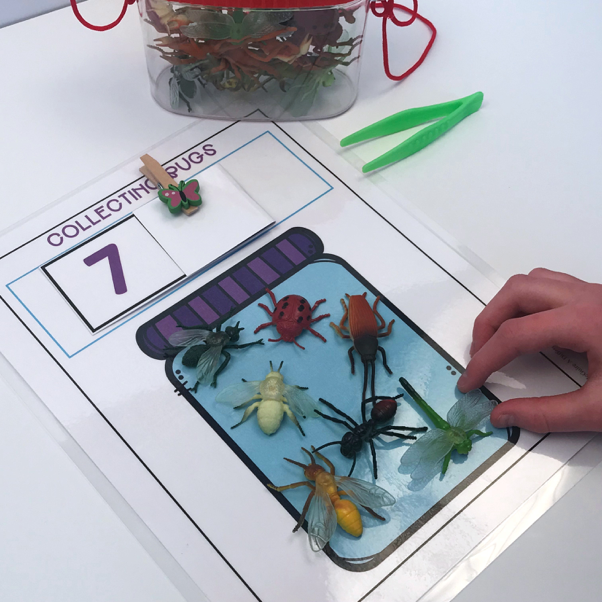 Use those same type of bugs, but this time throw them in a sensory bin and preprogram them by writing a number on their belly. I give each student a bug box and tweezers. 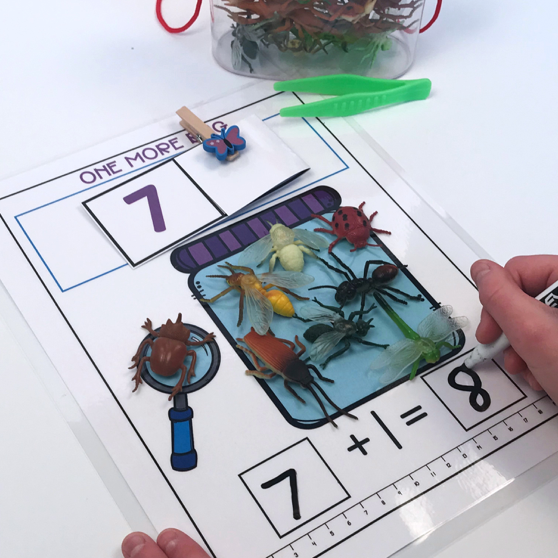 Students select a bug and read the number. Then they spin the greater/less than spinner to see who wins the bugs for their box. 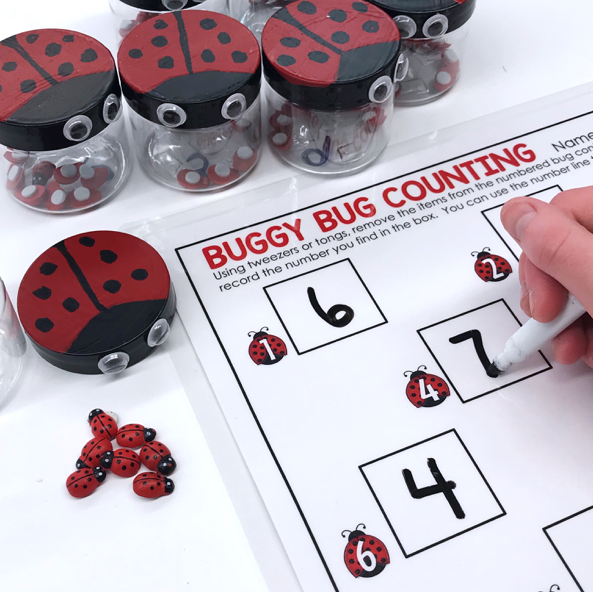 Mini toy bugs with numbers written in permanent marker on the bottom. I am always looking for ways to make numeracy and counting back and forward more fluent. 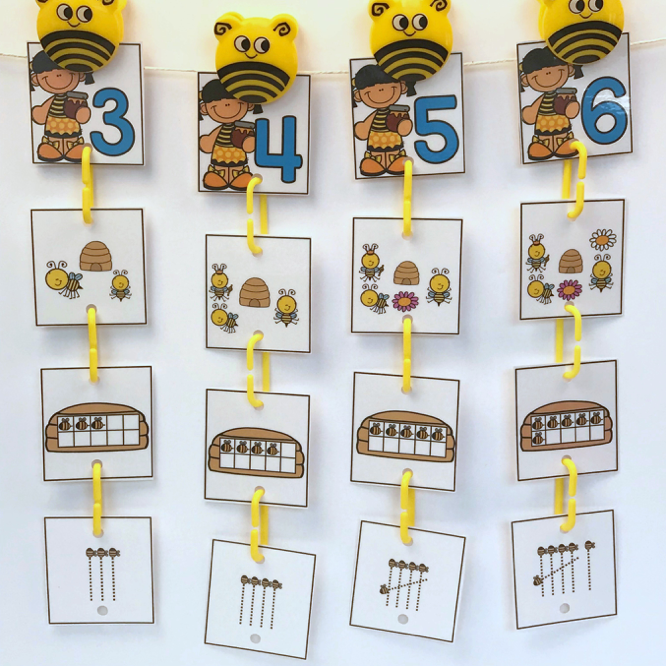 That means my students need lots of practice and these bee stations give them that practice. Students select a card and place that many bees on the hive. They write the number in the box and then write the numbers that come after by counting on. Once their answer is written, they can open the self-correcting card to see if they answered correctly. Counting back works the same way. 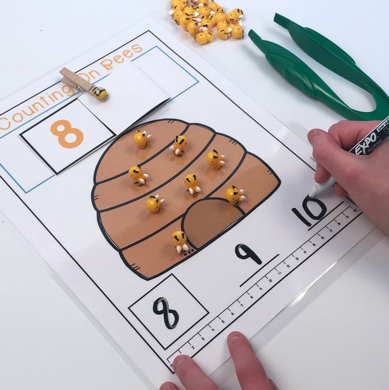 Students create the number by moving bees, write the number in the box and then write the numbers that come before by counting back. Opening the card after their answer is written gives them instant feedback. 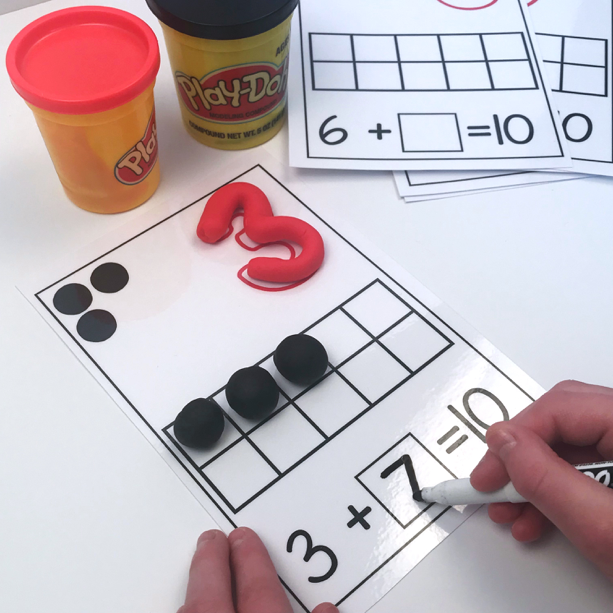 I also have two different playing mat options: one option offers a number line for students who need it and the other is without a numberline. 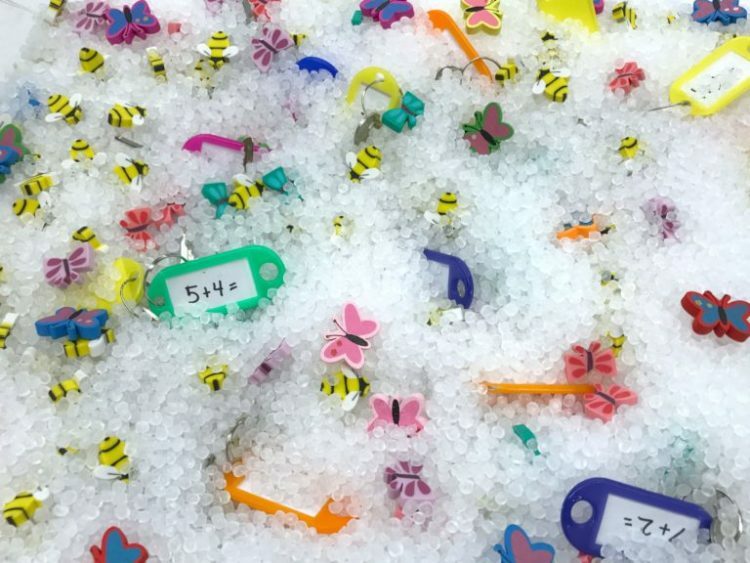 Miniature bees, bee erasers, or you could yellow pompoms, erasers, buttons or beads. If you’re working on missing addends in your class, this station will be a gift! Students get to practice missing addends and it’s independent. 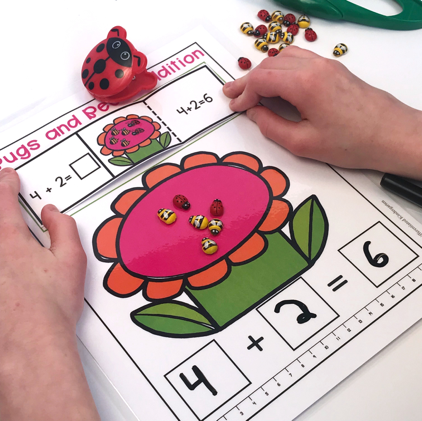 They simply write the equation placing the first set of ladybug dots on the first wing of the ladybug, and then they determine how many more dots they will need to complete the total number of dots. Dots (use flat black marbles or black buttons. 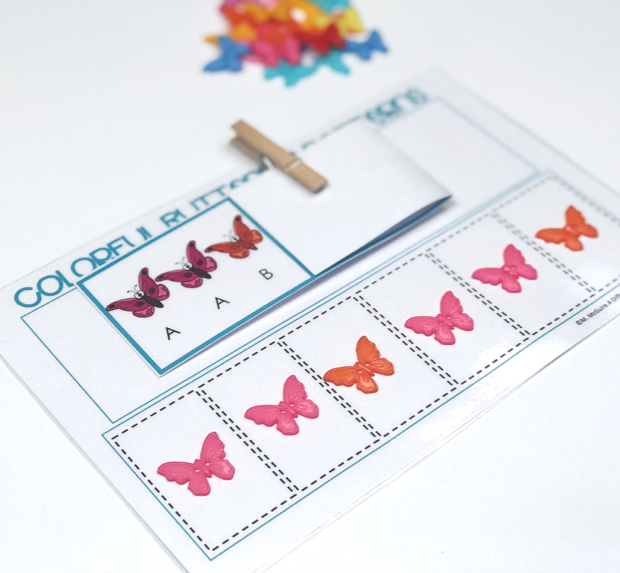 Stickers make a great fine motor activity, they are challenging to manipulate and place just so . . . 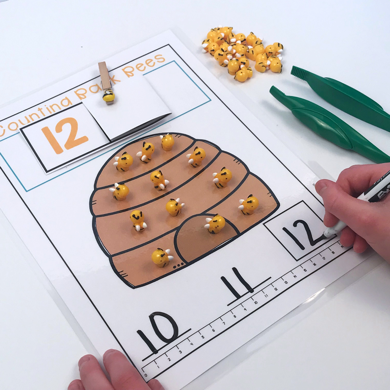 This station will build fine motor and allow your students to use their counting skills. It’s definitely a favorite amongst my students each month. 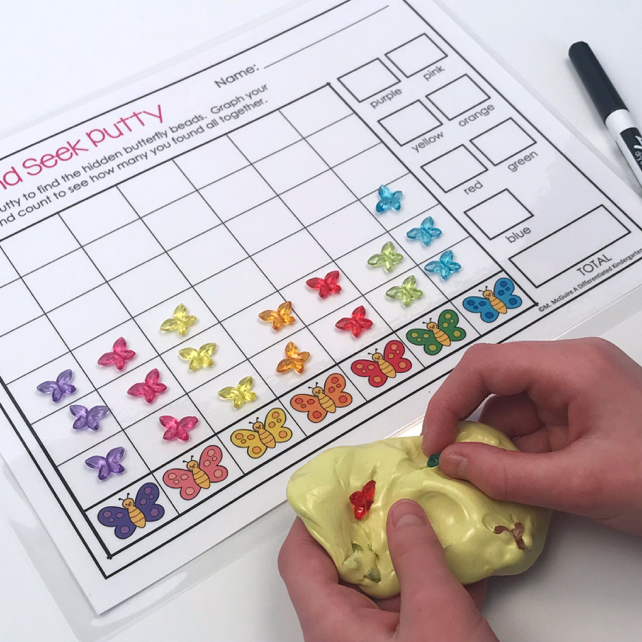 One sheet allows students to trace and total up all the stickers used. One sheet allows you to place a specific sticker next to a box. 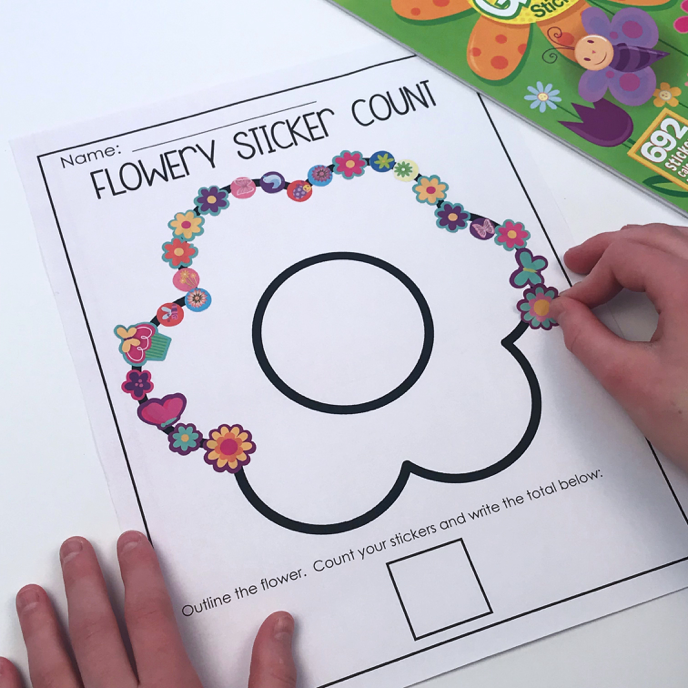 Students use those three types to outline the template and then count up the individual stickers of each type and record the number next to the sticker in the box. Small thematic stickers or any small stickers you can find. 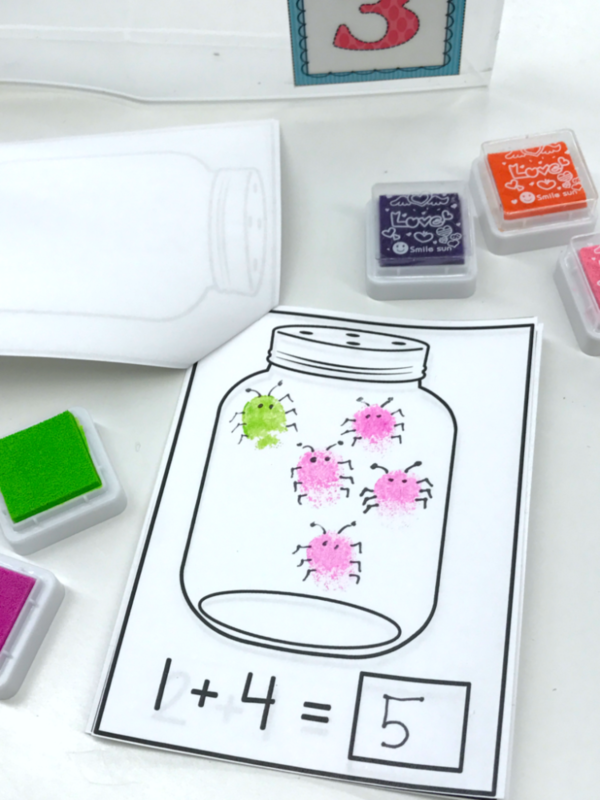 Using a little stamp pad and some black pens, students represent addition equations by creating bugs to place in the bug jar. I love that it’s hands-on and appeals especially to my artistic learners who do always get a ton of opportunities to be creative and do math at the same time. Water gel beads never get old. Trust me, I use them every month and every month they LOVE them. 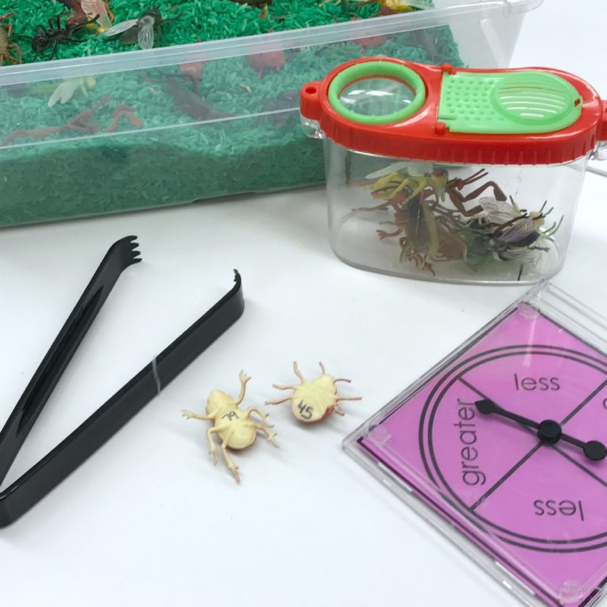 They also pose a challenge for my students because I insist they use their pincher fingers to pick them up . . . they’re slippery little buggers and that make them challenging. 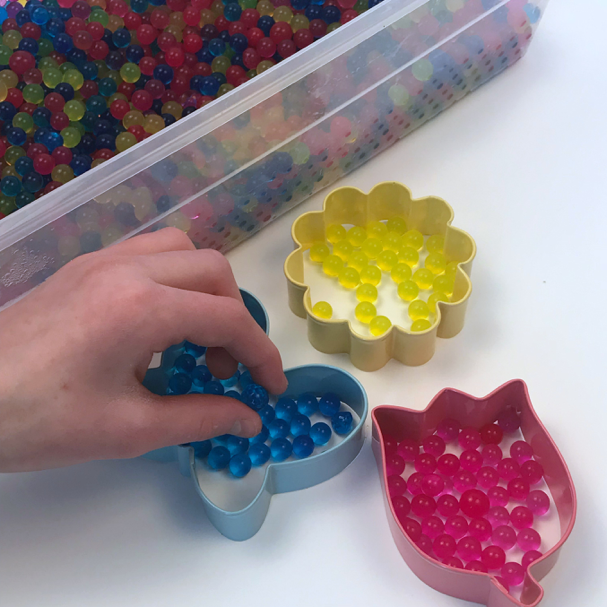 Sometimes we simply sort by color . .
Other times you can use beads to make a game of who can fill their cookie cutter first when you add a dice. Each month I have a set of lego challenge for my students to try their hand at . . . There is always this big question of which item I will challenge them with each time we change over new stations. They love it. This month we have a ladybug, butterfly and flower. Their creations are seldom exactly like mine and, quite often, they are actually a ton better!! Practice makes perfect and variety is the spice of life. I want lots of variety to give my students practice making, not only letters, but practicing their sight words as well. 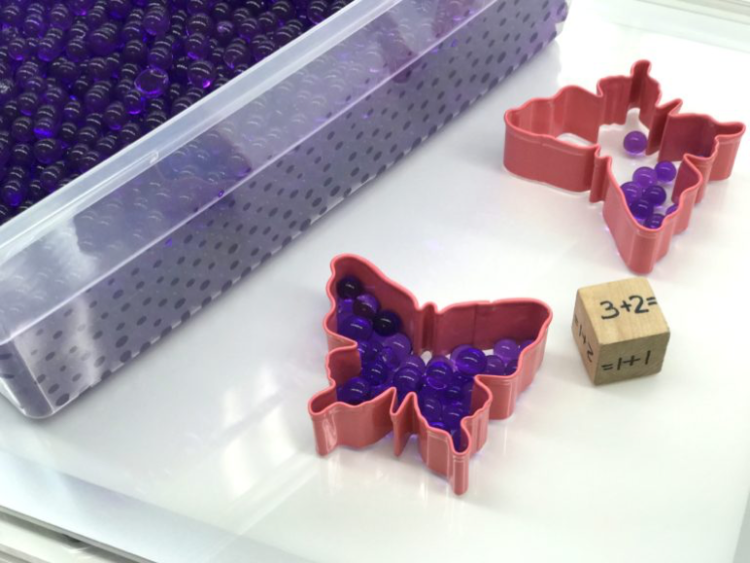 By offering them erasers, small bugs or even these transparent butterflies and flowers (I like to place them on a light table!) they get the opportunity to build and practice words. The word cards are editable, so I am sure they are practicing words that are meaningful to them. That also means you can create word cards that are meaningful to your kiddos too. Any kind of small container will work. 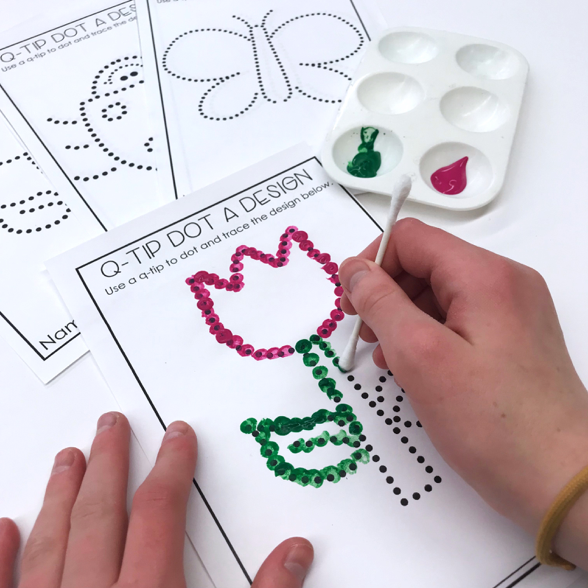 You can paint a ladybug on top using paint pens. These will be your Buggy Bug Counting containers. 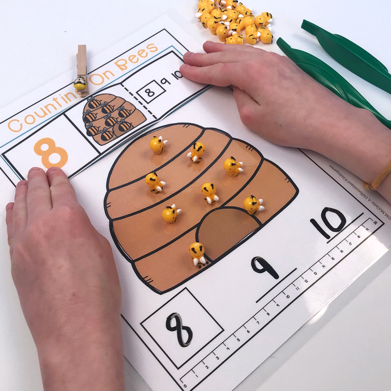 You can use erasers, buttons, beads or whatever you have lying around to put inside each container, number the bottoms and then students count the items in each container and record it on their sheets next to the corresponding number found on the bottom of the containers. Small Dollar Store mini white Surerite containers or other small containers with your choice of a garden item painted on top. I’m using ladybugs on small black containers. To add a bit of a challenge, make your second set of containers address adding. I have included a couple of different options for recording. Simply paint bumblebees on the top and number the bottoms. 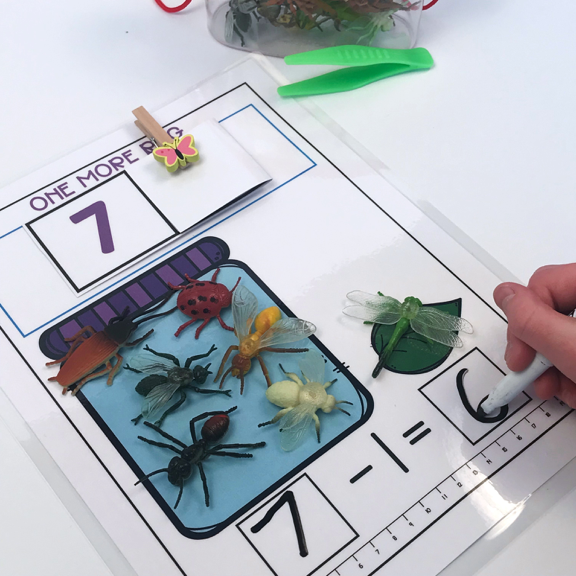 Then you will add various amounts of bugs (bees, ladybugs, butterflies) to each container for students to add together and record on their mat. Recording sheet printed on cardstock and laminated. I have given you a couple of different options. One has butterflies and bees and the other has bees and ladybugs. 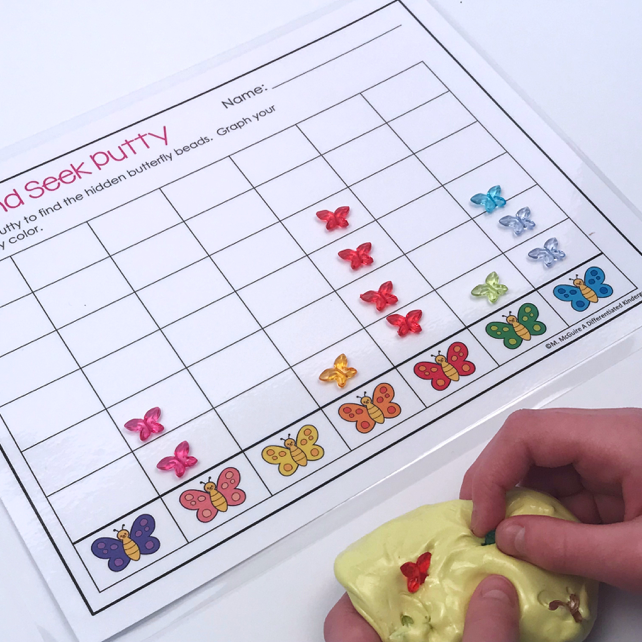 I love sensory play and by creating puzzles, this sensory station is self-correcting and independent. I want it to meet all my students’ readiness levels, so I have a variety of options like this capital to lowercase letter matching option. 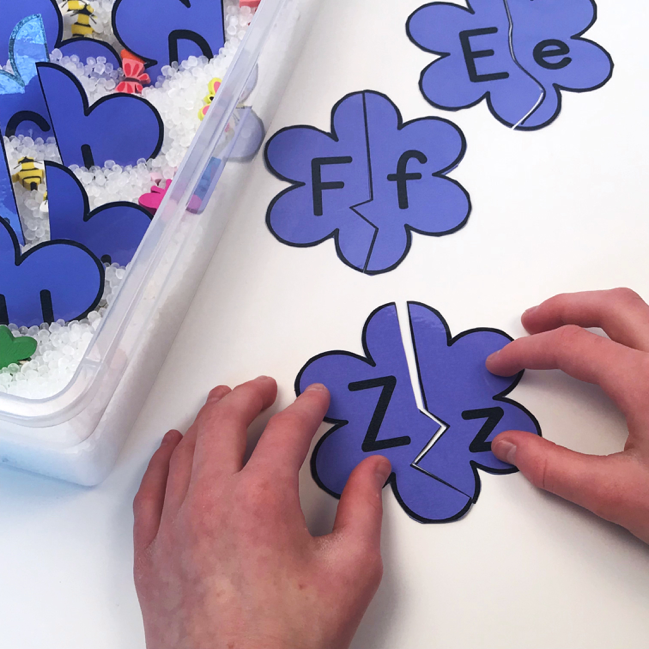 Capital/Lowercase Letter puzzles printed on one color of cardstock, laminated and cut apart. There is also a lowercase letter to beginning letter sound set . 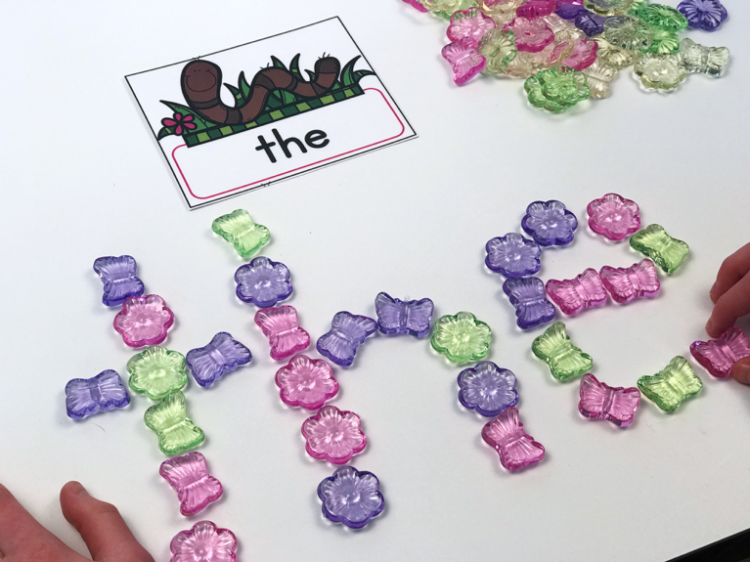 . .
Lowercase/Beginning Letter Sounds puzzles printed on one color of cardstock, laminated and cut apart.
. . . one that has CVC words and pictures matching up . 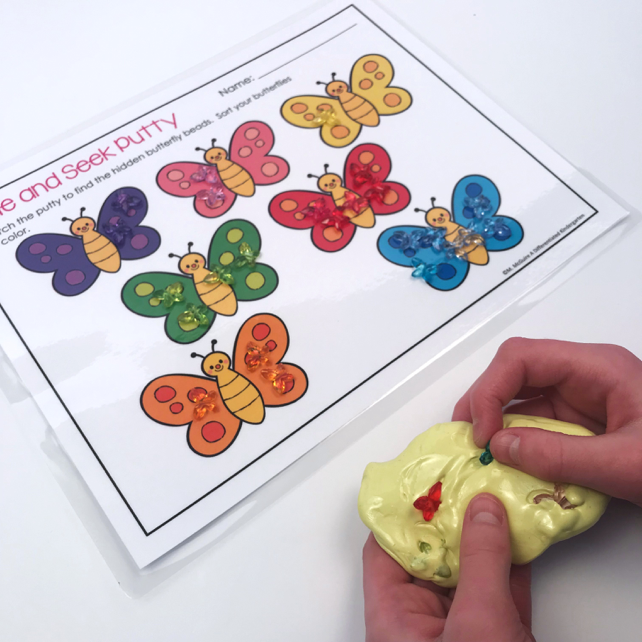 . .
CVC/Picture puzzle pieces printed on cardstock and laminated for durability.
. . . and finally, a CVCC/CCVC set that will challenge your students who are working on decoding more difficult words. Blend/Picture puzzles pieces printed on cardstock and laminated for durability. 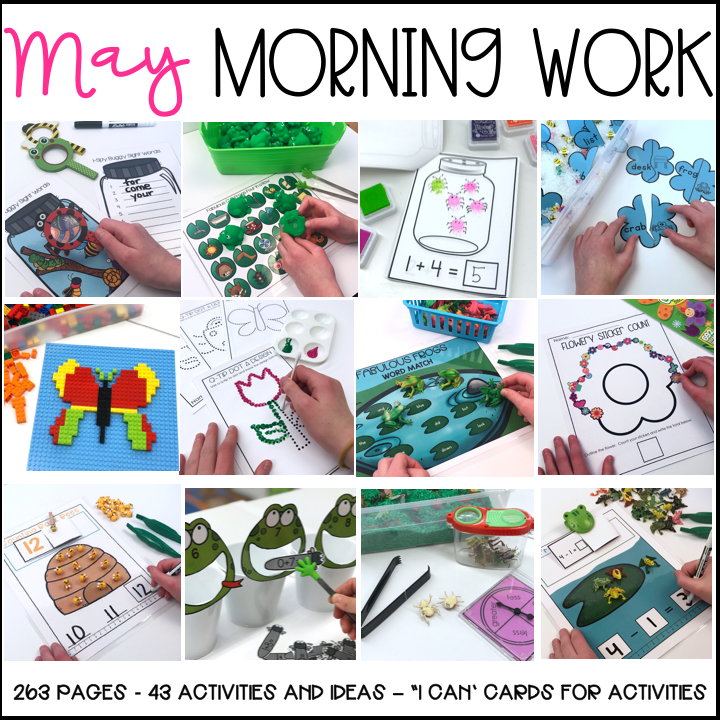 Patterning is a skill that students need across the board so I tend to try to include at least one patterning activity in every set of morning workstations. I used some colorful little butterfly buttons for this one, but you could use beads, erasers or even just colored buttons or pompoms as butterflies if you get desperate. Students create and continue the pattern, and then open the card to check their work when they have finished. Self-correcting cards printed on cardstock, laminated and folded to hide answer. Plastic frogs are so engaging and fun. I preprogrammed a set of small ones with letters and for this editable letter playing mat. Each student at this station will need a playing mat with the letters of your choosing. 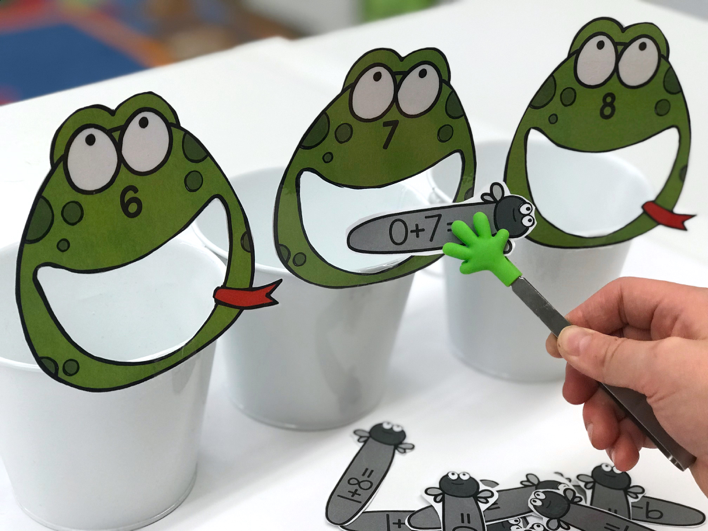 You preprogram the toy frogs using a Sharpie or paint pen. Students then use tongs to take turns selecting a from without looking. The first one to fill their mat is the winner. Rubber frogs or small plastic toy frogs programmed with letters of your choice using paint pens or permanent marker. 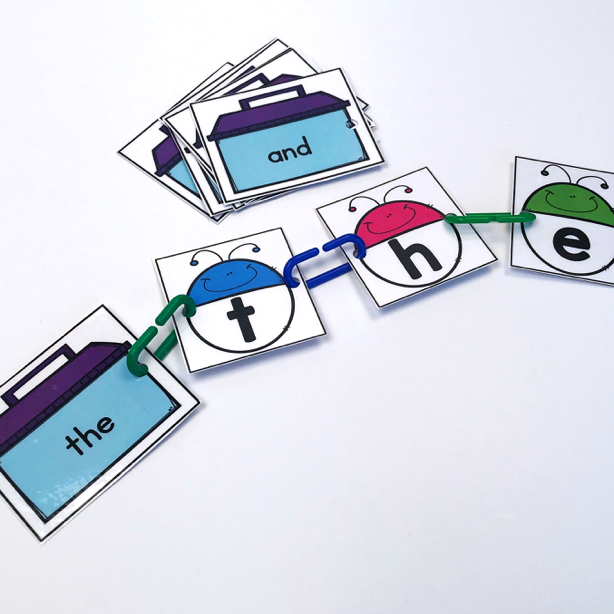 If your students need more of a challenge, there is also an editable sight word version as well. 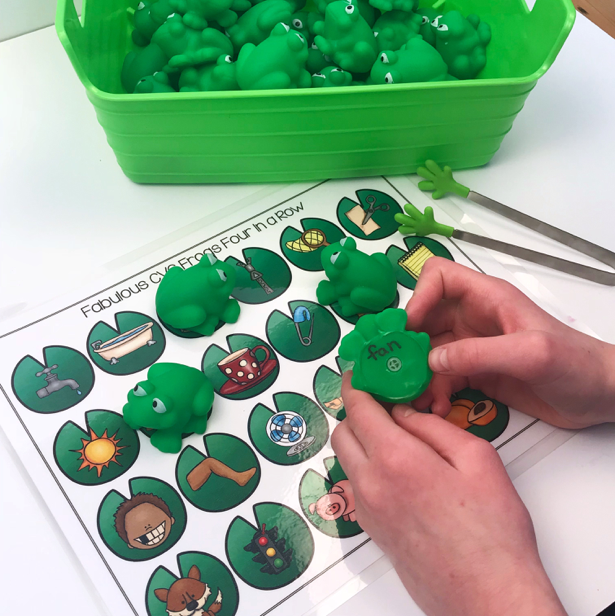 Rubber frogs or small toy frogs that are programmed with sight words of your choice. 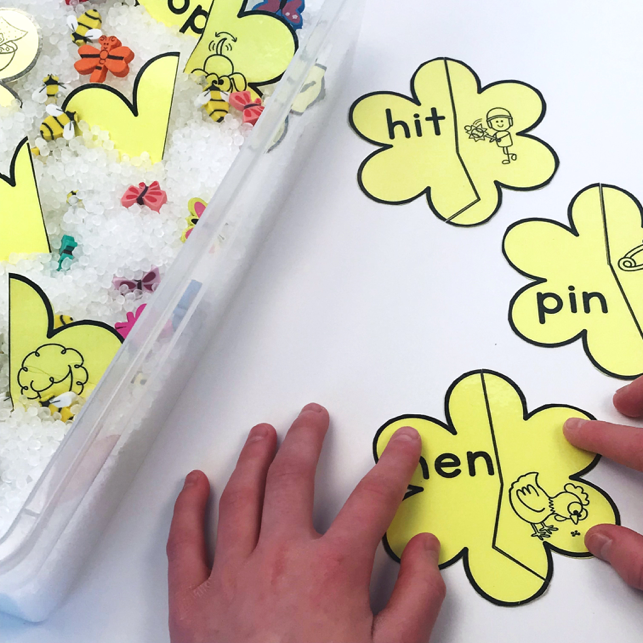 Small sensory tubs are portable and students can manage them on their own. I have several going at any given time in my classroom. 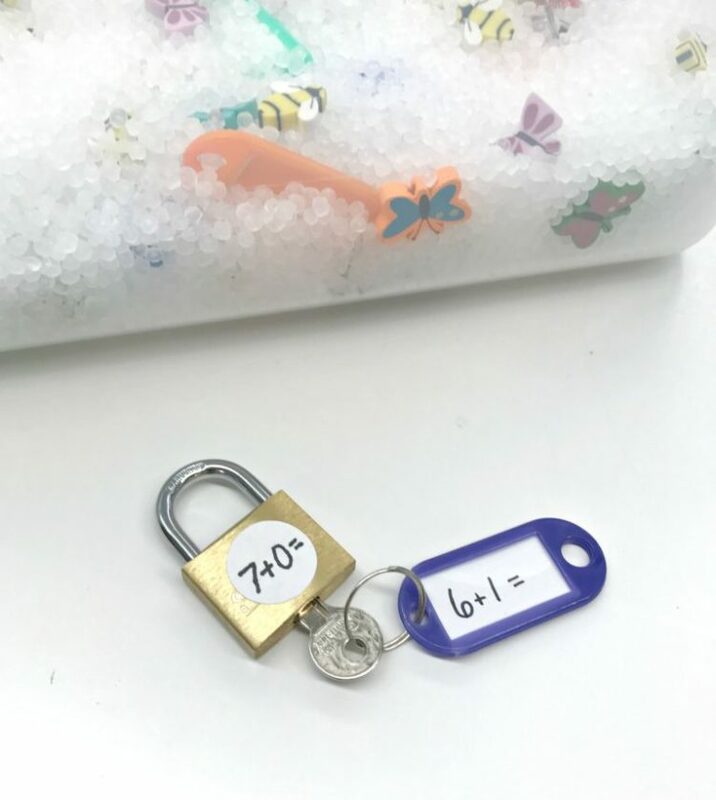 This month’s garden and bug them has hidden locks and keys in them with addition and subtraction problems in varying degrees of difficulty. Thematic items including poly beads, garden confetti or other garden or bug thematic items. Several differently keyed lock and key sets. I bought mine individually from discount and dollar stores. Do not buy a ‘lot’ of keys as they will be keyed all the same way. You can also ask parents to donate any old, unused locks and keys. It’s a great way to assure they aren’t all keyed the same way. Key fobs/tags with labeling capability. Frogs love flies so let your students feed them these math flies. 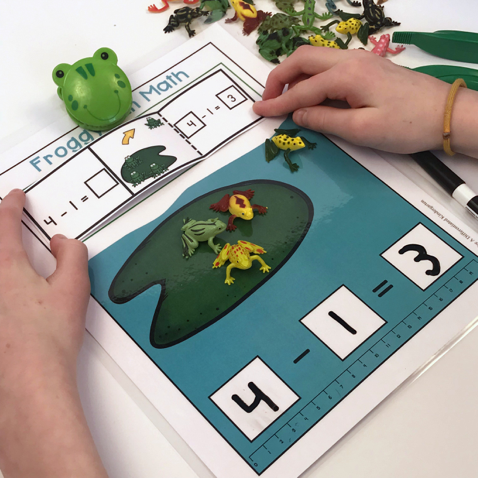 Students select a fly, solve the equation and feed the frog. Sensory bin with thematic items. More fun with plastic frogs. 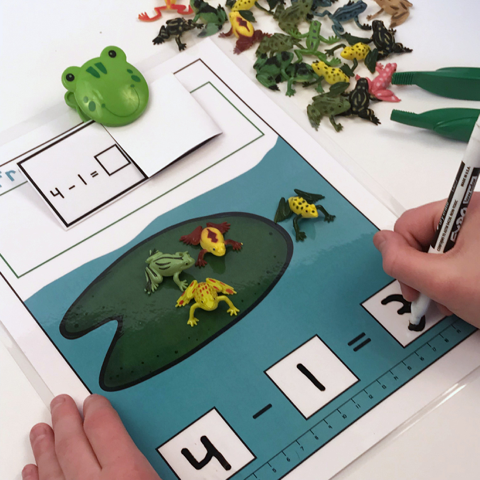 Use these fun frogs to create a scene that matches the equation and write the answer on the playing mat. Then open the self-correcting card to see if they did it correctly. Or use them for subtraction equations . . . Solve the problem and check your answer. 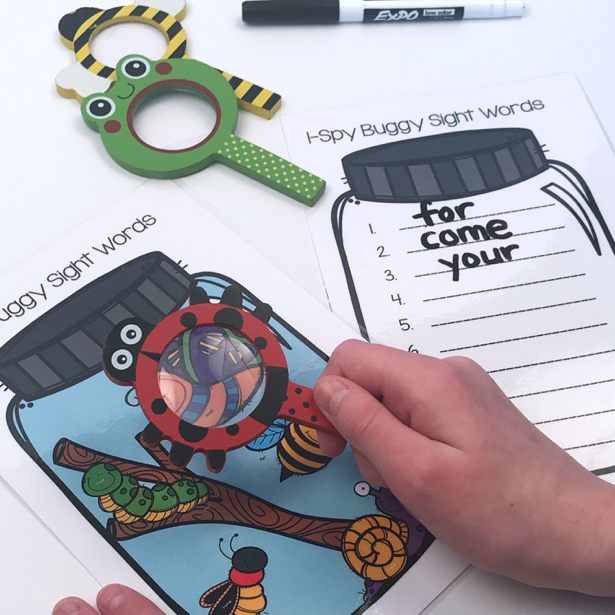 Cute magnifying glasses warrant a fun I-Spy station and this one is editable. Students use the magnifying glasses to find the hidden sight words and then record them on their bug jar recording sheet. 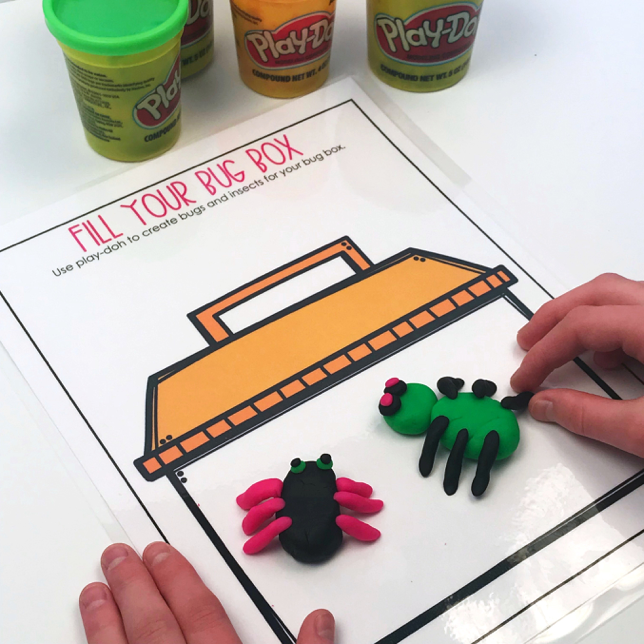 If you prefer you can also use small toy bugs with words written on the belly and small bug boxes. You will need a permanent marker to write the words on your bugs. 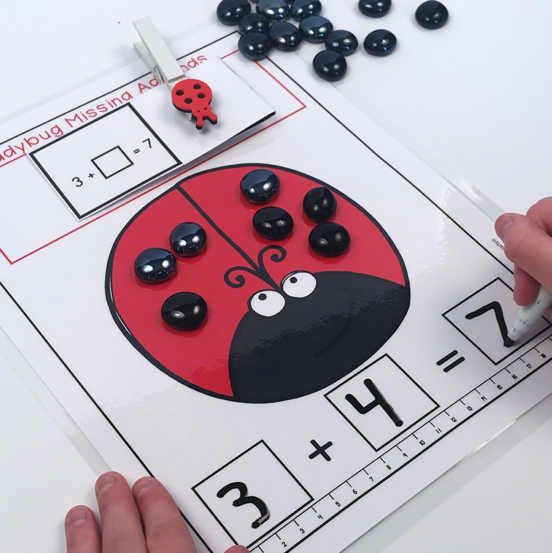 Grab some erasers, mini bugs, buttons or beads to keep your students engaged in this independent addition station. Keeping it independent, keeps your teacher sanity and give you the assurance they are getting instant feedback. Finally, I’ve taken ladybug missing addends a bit further with this simple, differentiated book. There are two levels of difficulty from which you can choose. 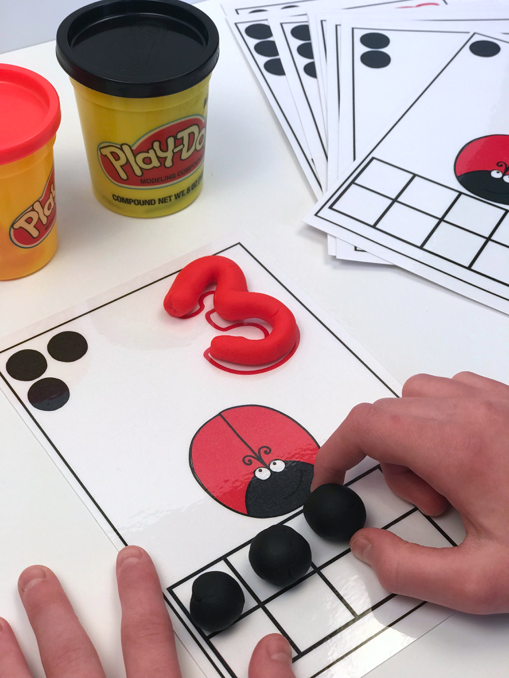 Students use black stickers they same way they used flat black marbles and buttons in Station 21 to solve the missing addend equation. And that’s everything. If you’d like to learn more about this and other Morning Work Station packets available, please click the click on the picture below or HERE.